The tanks that the Republic of Ireland Defence Forces Cavalry Corps had previously operated could not be more different to the Comet. The Landsverk L-60, 2 of which were operated from 1934, were small and lightly armed. The tanks to follow these, four Mk. VI Churchills, were slow thick-skinned leviathans. 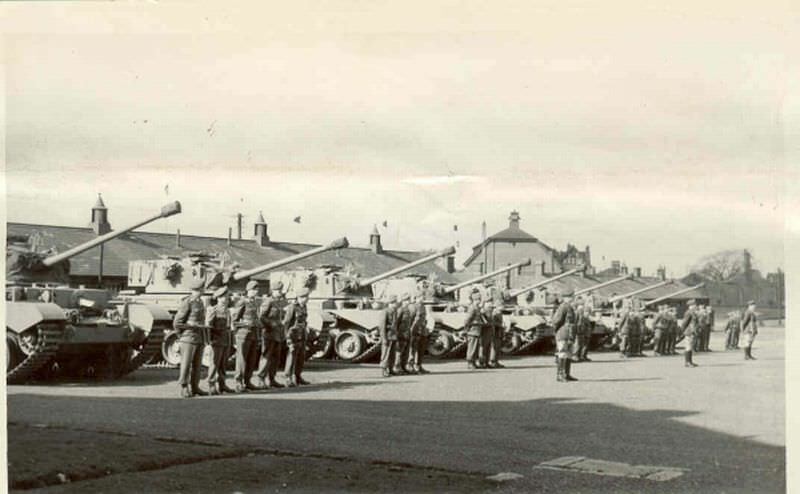 In 1958, the Cavalry Corp (Irish: An Cór Marcra) began to receive a small number of A34 Comets which, like the preceding Churchills, were purchased from the British War Office. The Comet was the polar opposite of both vehicles, and was the most technically advanced tank then in service with the Irish cavalry. 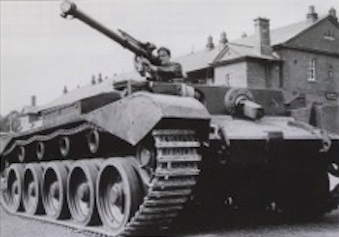 Essentially, the officially named “Tank, Cruiser, A34, Comet”, was an upgrade to the Cromwell cruiser tank. It was designed in 1943 and entered service in 1945, towards the end of the Second World War. It set a trend in tank design that would be followed by the world’s next generation of tanks, the Main Battle Tank or ‘MBT’, as it had a balanced blend of armor, mobility and firepower. It was powered by the Rolls Royce Meteor Mk.III 600hp V12 petrol engine. This engine was derived from the Merlin engine which was used on the famous Spitfire fighter plane and gave the tank a top speed of 32 mph (51 km/h). The Comet weighed 33.53 tonnes (32.7 long tons). This weight was supported on a Christie type suspension with five road-wheels. The drive sprocket was at the back while the idler was at the front. The track return was supported by four rollers. The main armament consisted of the Vickers 77mm (3.03 in) High-Velocity Gun, which was derived from the famous 17-Pounder anti-tank gun. Firing APCBC (Armor-Piercing Capped Ballistic-Cap), the specific type of anti-armor round given to the Irish Army, the gun could penetrate up to 147 mm (5.7in) of armor. Secondary armament consisted of coaxial and bow-mounted 7.92mm BESA machine guns. The tank had up to 102mm (4in) of armor. There were two versions of the Comet, designated as ‘Types;’ Type A and Type B. Both of these versions were sold to the Irish. The major difference between the two was the exhaust arrangement. The Type A had a ‘Normandy cowling’ over the exhaust ports. The Type B did away with this, replacing it with standard nozzles. The Type B also saw the addition of smoke-dischargers to the turret cheeks. The Comet had a crew of five, consisting of Commander, Gunner, Loader, Bow-Machine Gunner, and Driver. 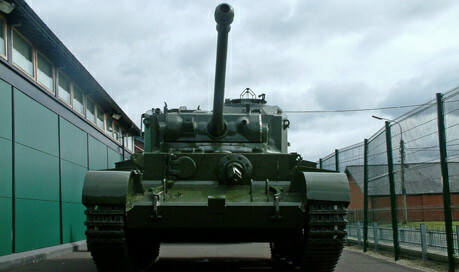 The tank served with the British Army until 1958 when it was replaced by the famous Centurion Main Battle Tank. The Comet stayed in service with a number of other countries however, including Cuba, Burma and Finland. It is often queried as to why the Irish government did not acquire tanks from the United States, who had plentiful stocks of surplus tanks such as the famous M4 Sherman medium tank and the M24 Chaffee light tank. The fact is the Irish thought the Comet superior to both vehicles. The Comet had better speed and cross-country performance than the M4, and better armament than the M24. As to the question of why the Defence Force didn’t purchase America’s new light tank, the M41 Walker-Bulldog, it was simply a matter of cost. The Irish Defence Department had a budget of just 80,000 Irish Pounds/IE£ It was planned to purchase just four Comets for this amount in 1954/55. In 1958, the cost of the vehicles had fallen to IE£22,000 each, so four were purchased in September 1958. Ireland received these first four Comets in December of 1958. The tanks arrived at North Wall in Dublin, and with the help of accompanying handbooks, were driven to the Curragh. It was planned that further eight tanks would be purchased to bring the 1st Cavalry Squadron’s tank force up to full strength which, including the four Churchills, would have been a grand total of 16 tanks. This was scaled back to just another four tanks for the same amount of IE£22,000. These four were delivered in early 1960, two late-January, two early-March. This brought the strength of the 1st Cavalry Squadron to a combined strength of 8 Comets and 4 Churchills (12 tanks). As previously stated, the Comets served with the 1st Cavalry Squadron who were based at Curragh Camp in Kildare. For their initial years in service, the Comets remained in the standard British green paint. At some point in their history, the tanks were repainted in a light grey, similar to the L-60s. The tanks were used extensively in training operations at the Curragh and at the Glen of Imaal (Irish: Gleann Uí Mháil), in the Wicklow Mountains. 5,948 acres of the Glen has been used as an artillery and gunnery range since 1900. The vehicles also took part in a number of public and military parades. Compared to other vehicles, the Comets had a relatively short service life with the Cavalry Corps. This is despite being a very popular vehicle with the Irish armed forces. Its short service is largely due to a lack of foresight by the military in not purchasing enough spare parts to accompany the tanks. To add to this, the caliber and cartridge type of the Comets gun was unique, meaning resupplying was not an easy task. Supplies of ammunition grew even lower when it was discovered that HE (High-Explosive) rounds provided to the military had faulty fuses. In the 1970s, the Comets were on the ropes. By 1970, just 55 APCBC shells remained in stocks. There were plans to turn the vehicles into turretless personal carriers, along the lines of the ‘Kangaroo’ vehicles used by the Allies in WW2. However, It became increasingly hard to maintain the tanks which were breaking down, overheating or throwing their tracks on an almost daily basis. The final Comet shoot took place in 1973. The force was retired when ammunition and spare parts had completely run out. They were replaced in service by the more up to date FV101 Scorpion CVR(T), 16 of which were purchased, once more, from the United Kingdom. A Sandard A34 Comet, specifically a ‘Type B’, in the standard British Olvive Drab paint it arrived in. Illustrated by David Bocquelet. 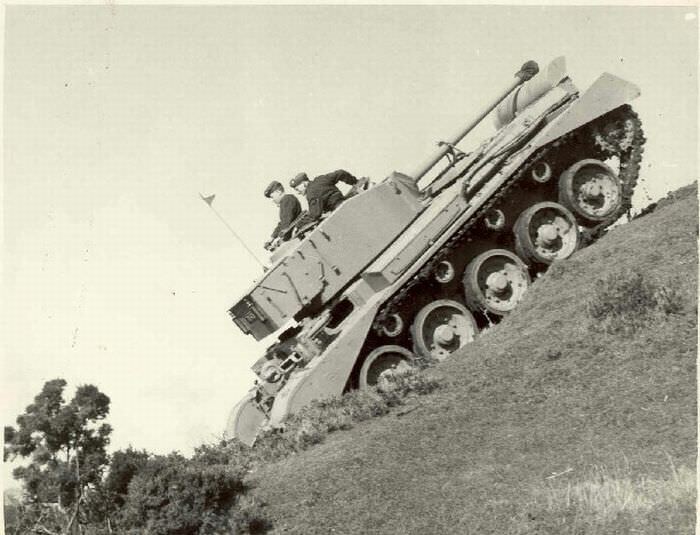 A34 Comet of the Curragh Command, circa 1960s. By this time, all comets had been painted this light greay colour. Illustrated by David Bocquelet. The Symbol on the side of the turret represents Curragh Command. It depicts gold oak leaves and acorns on a red background. There are two theories to its origin. 1: The oak leaf and acorns reflect the name of the county the camp is situated; Cill Daire, ‘The church of the oak’, anglicised as Kildare. 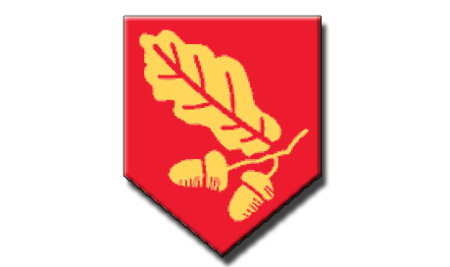 2: It depicts the oak leaf and acorn represents the oak trees that abound the perimeter edge of the Curragh military camp. The improvised ‘Headless Coachman’ with 90mm Recoilless Rifle. Illustrated by David Bocquelet. On the 11th of August 1962, one of the Comets suffered a catastrophic fire which destroyed the turret. With no spares to repair it, it was considered for scrap but, as the rest of the vehicle remained in a serviceable condition, it was decided to make use of it. The tank became known as “The Headless Coachman” and was used for a while to ferry tar barrel targets too and from the range area in the Glen of Imaal. However, a Captain by the name of Roger McCorley soon came up with a better use of the vehicle. McCorley had recently finished a course on the operation of the Swedish Bofors PV 1101 90mm Recoilless Rifle, a small number of which were in service with the Irish Military. The rifle could fire a High-Explosive Anti-Tank (HEAT) shell, capable of penetrating up to 380mm (15in) of armor, to a distance of 900 meters (985 yards). This weapon was on a wheeled base and was usually towed. A plan was hatched to mount this weapon onto the turret ring of the damaged Comet, turning into a something of an improvised tank-destroyer. The idea was passed to the Director of Cavalry, Colonel J. Stapleton, who formally approved the concept for trials. With this, the Cavalry Corps engineers fashioned an attachment point on the turret ring to mount the Recoilless Rifle upon. Plates were welded over the apertures leading to the driver and bow gunner compartment to avoid back-blast from the gun entering their position. It was taken for testing at the Glen of Imaal on the 27th of January 1969. Tests were successful, with the gun performing well and providing accurate fire from all angles of traverse. The tests led to the approval of further development. Plans were made to incorporate ammunition racks in the walls of the turret basket, and a shield around the gun to protect the exposed crew. There were also plans to introduce another 90mm rifle, or use another Comet to mount an 81mm or 120mm mortar. Unfortunately, funds could not be provided to continue with any of these projects. The gun was returned to the Infantry and “The Headless Coachman” was turned into a target on the gunnery range at the Glen. Of the eight Comets used by the Cavalry Corps, six survive as two were destroyed after accidents (One of these became the ‘Headless Coachman’). Four of the tanks remain in Ireland. These can be found at the Curragh. Two are used as gate guardians, one is on display alongside a surviving Churchill Mk. VI. The fourth Comet still runs and is kept under cover, it is sometimes run in parades. The remaining two found their way back to England. One of which one is at The Muckleburgh Military Collection in Norfolk. The museum received it in 1987 in exchange for a Peerless lorry. B 2012, the Comet had been restored into a working condition. The second Comet was first acquired by the long-closed Budge Collection, and was later sold to the Jacque Littlefield Collection in California. It is now presumably with the Collings Collection in Massachusetts. For our U.K. readers, this article can also be found in the November 2018 issue of ‘Classic Military Vehicle‘ Magazine. An Cosantóir, The Irish Defence Journal, March 1983 issue. 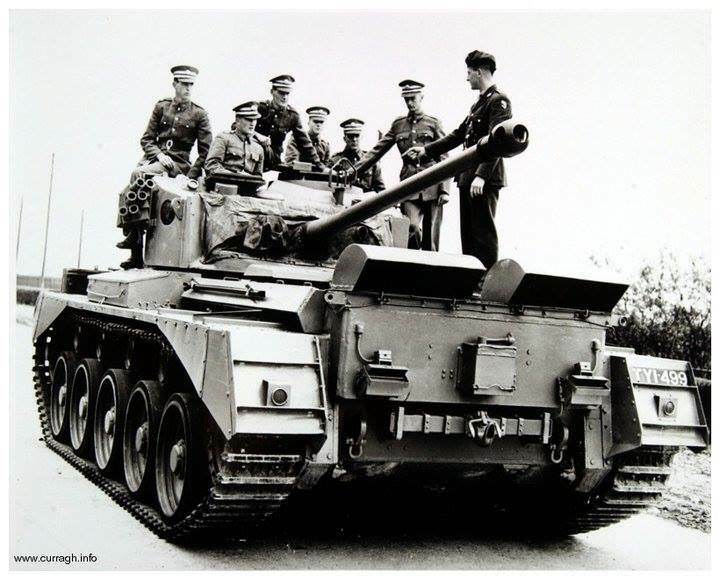 As mentioned previously,2 Comets went to the UK,one c.1980 supposedly for the Grange Cavern museum in North Wales,but don’t think it was displayed there.The Bren gun carrier or possibly the Ferret A/c was received in exchange. The other went in the 90,s,again apparently in connection with the De Savery collection at Muckleburgh,Weybourne,Norfolk,along with a Unimog/Landswerk which has been on display there for years.A Peerless chasis/engine unit was received in exchange. I imagine both Comets survive,wherever they are now. You may wish to check with Workshops in that ,as far as I am aware,the Comet in the “display” photo is not the running one which certainly was always kept under cover within the Vehicle Compound.The former is the one that stood on a plinth outside the NCO,s Mess.and before that on the side of Plunkett Square. So 3 on the Curragh,one in Athlone, 1 buried on the Artillery Ranges,2 in the UK.No.8 was certainly in Plunkett in the 90,s Someone has the answer to it’s current whereabouts. Thank you for the info, much appreciated! Of the eight Comets two were destroyed after accidents, four remain in Ireland three as gate guards and one in working condition at the Curragh. The remaining two went back to England of which one is at The Muckleburgh Military Collection in Norfolk. It was exchanged in 1987 for a Peerless lorry and by 2012 had been restored into working condition. Its Irish number was either TY1 431 or TYI 432. The second Comet was first acquired by the Budge Collection and later sold to the Jacque Littlefield Collection in California and now presumably with the Collins Collection. Excellent to hear from such a Prestigious museum. Thanks for the info, ill make some additions. There is (or was the last time I saw it), a Comet tank in rhe tank area of the military museum in Brussels with a brass plaque on it saying ‘a gift from the Irish Army’. Maybe that,s the “missing one” !!! A Landswerk A/c officially went from the Army to both Holland and Sweden and a Leyland/Ford to Bovington .The Belgian transfer doesn’t seem to be common knowledge here at home.